An amortization schedule is a list of payments for a mortgage or loan, which shows how each payment is applied to both the principal amount and the interest. The schedule shows the remaining balance still owed after each payment is made, so you know how much you have left to pay. To create an amortization schedule using Excel, you can use our free amortization calculator which is able to handle the type of rounding required of an official payment schedule. You can use the free loan amortization schedule for mortgages, auto loans, consumer loans, and business loans. If you are a small private lender, you can download the commercial version and use it to create a repayment schedule to give to the borrower. 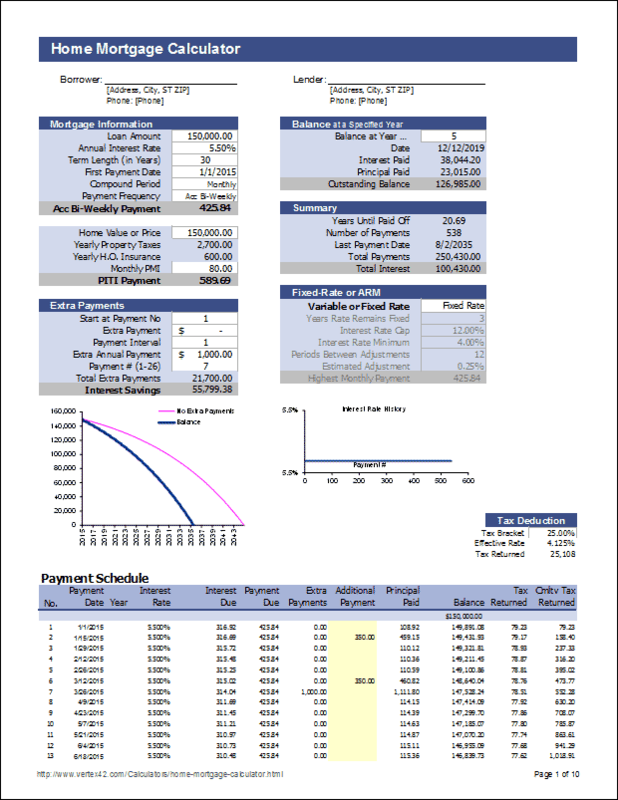 This spreadsheet-based calculator creates an amortization schedule for a fixed-rate loan, with optional extra payments. Start by entering the total loan amount, the annual interest rate, the number of years required to repay the loan, and how frequently the payments must be made. Then you can experiment with other payment scenarios such as making an extra payment or a balloon payment. Make sure to read the related blog article to learn how to pay off your loan earlier and save on interest. The payment frequency can be annual, semi-annual, quarterly, bi-monthly, monthly, bi-weekly, or weekly. Values are rounded to the nearest cent. The last payment is adjusted to bring the balance to zero. Loan Payment Schedules: The workbook also contains 2 other worksheets for basic loan payment tracking. The difference between the two has to do with how unpaid interest is handled. In the first, unpaid interest is added to the balance (negative amortization). In the second (the one shown in the screenshot), unpaid interest is accrued in a separate interest balance. Note: In both cases, the Payment Date column is for reference only. This spreadsheet handles loans in which calculations are not based on payment date. See the Simple Interest Loan spreadsheet if you have a loan that accrues interest daily and the payment date matters. The Commercial Version allows you to use the spreadsheet in your loan or financial advisory business. The spreadsheet is not password protected, which means you can see the calculations and customize the spreadsheet. The header includes a place for the borrower's name and lender's info: View Screenshot. You could customize the header to create a "prepared by" section and include your logo if you wanted: Click Here to see an example. The Vertex42 logo and copyright are outside the print area so that they don't show up when you print the schedule. This is a commercial use license of our Home Mortgage Calculator spreadsheet. It allows you to run an analysis on either a fixed rate or variable rate mortgage. This is a commercial use license of our Interest-Only Loan spreadsheet. It allows you to create a payment schedule for a fixed-rate loan, with optional extra payments and an optional interest-only period. 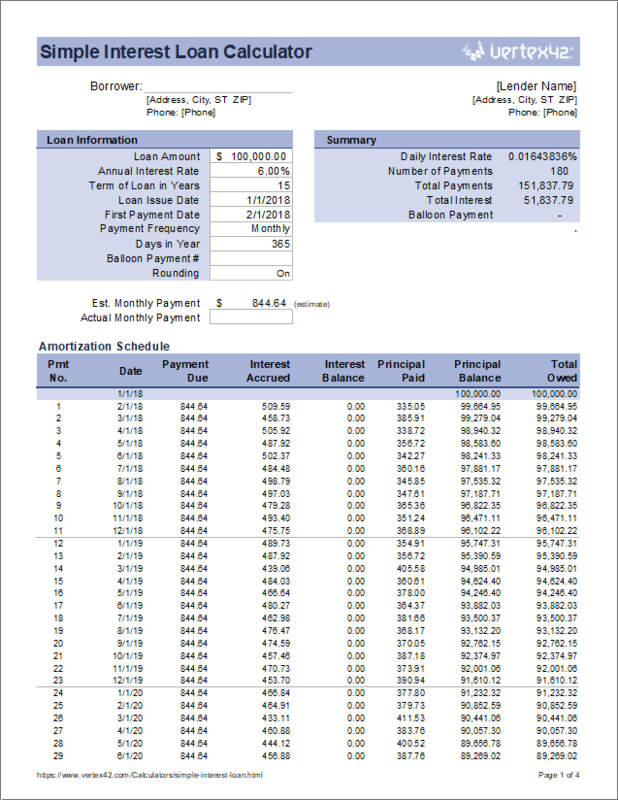 This spreadsheet provides a more advanced way to track actual payments than the Payment Schedule included in the standard Loan Amortization Schedule. It can be used to track missed payments, late payments, early payments, fees, and escrow. It does not handle daily interest accrual like Bonus #2. It is designed to avoid negative amortization. Added 5/11/2016: The Payment worksheet in the new LoanAmortizationSchedule.xlsx file (version 2.0) has been redesigned to make basic loan tracking easier. 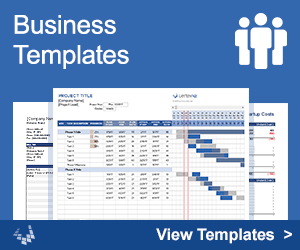 Two versions of the Payment worksheet are included. One handles unpaid interest by adding it to the principal. The other accrues unpaid interest in a separate interest balance. A Yearly Summary table has also been added, though it is hidden by default. Usually, the interest rate that you enter into an amortization calculator is the nominal annual rate. However, when creating an amortization schedule, it is the interest rate per period that you use in the calculations, labeled rate per period in the above spreadsheet. Basic amortization calculators usually assume that the payment frequency matches the compounding period. In that case, the rate per period is simply the nominal annual interest rate divided by the number of periods per year. When the compound period and payment period are different (as in Canadian mortgages), a more general formula is needed (see my amortization calculation article). Some loans in the UK use an annual interest accrual period (annual compounding) where a monthly payment is calculated by dividing the annual payment by 12. The interest portion of the payment is recalculated only at the start of each year. The way to simulate this using our Amortization Schedule is by setting both the compound period and the payment frequency to annual. There are two scenarios in which you could end up with negative amortization in this spreadsheet (interest being added to the balance). The first is if your payment isn't enough to cover the interest. The second is if you choose a compound period that is shorter than the payment period (for example, choosing a weekly compound period but making payments monthly). A loan payment schedule usually shows all payments and interest rounded to the nearest cent. That is because the schedule is meant to show you the actual payments. Amortization calculations are much easier if you don't round. Many loan and amortization calculators, especially those used for academic or illustrative purposes, do not do any rounding. This spreadsheet rounds the monthly payment and the interest payment to the nearest cent, but it also includes an option to turn off the rounding (so that you can quickly compare the calculations to other calculators). When an amortization schedule includes rounding, the last payment usually has to be changed to make up the difference and bring the balance to zero. This might be done by changing the Payment Amount or by changing the Interest Amount. Changing the Payment Amount makes more sense to me, and is the approach I use in my spreadsheets. So, depending on how your lender decides to handle the rounding, you may see slight differences between this spreadsheet, your specific payment schedule, or an online loan amortization calculator. With this template, it is really quite simple to handle arbitrary extra payments (prepayments or additional payments on the principal). You simply add the extra payment to the amount of principal that is paid that period. For fixed-rate loans, this reduces the balance and the overall interest, and can help you pay off your loan early. But, the normal payment remains the same (except for the last payment required to bring the balance to zero - see below). This spreadsheet assumes that the extra payment goes into effect on the payment due date. There is no guarantee that this is how your lender handles the extra payment! However, this approach makes the calculations simpler than prorating the interest. If you are on your last payment or the normal payment is greater than (1+rate)*balance, then pay (1+rate)*balance, otherwise make the normal payment. The "payment type" option lets you choose whether payments are made at the beginning of the period or end of the period. Normally, payments are made at the end of the period. If you choose the "beginning of period" option, no interest is paid in the first payment, and the Payment amount will be slightly different. You may need to change this option if you are trying to match the spreadsheet up with a schedule that you received from your lender. This spreadsheet doesn't handle prorated or "per diem" periods that are sometimes used in the first and last payments. One way to account for extra payments is to record the additional payment. This spreadsheet includes a second worksheet (the Loan Payment Schedule) that allows you to record the actual payment instead. (Just in case you find that more convenient.) For example, if the monthly payment is $300, but you pay $425, you can either record this as an additional $125, or use the Loan Payment Schedule worksheet to record the actual payment of $425. 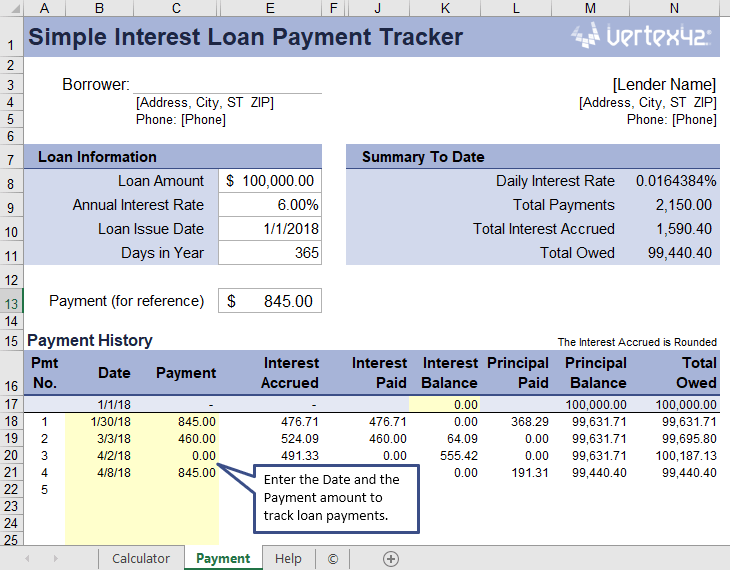 6/9/2014: New Loan Payment Schedule in Beta - Based on frequent requests for a more advanced loan payment tracker, we're experimenting with providing a new spreadsheet - see Bonus #4 above. 7/2/2013: Avoid Payday Loans - People in need of fast cash are often tempted by Payday loans but they should be avoided at all costs! Payday loan fees and interest rates are higher than all other sources of lending, and they can trap you in a vicious cycle of repeat borrowing to pay off previous payday loans. Look for other sources of money if you must borrow. 6/6/2013: Student Loan Refinancing - It used to be much easier to consolidate or refinance student loans than it is today. If you meet income requirements, Federal student loans can often be refinanced with a lower interest rate, but for individuals who are earning higher income or who carry private student loans – the options are much more limited than they used to be. 5/22/2013: Understanding Amortization Calculation - The process of paying off a mortgage or loan that includes both a principal balance and interest payments. A free online amortization calculator will let you see what different payment frequencies mean for paying off your debt.